Late last year we started hearing murmurs about Mounties, the new side project of Canadian indie vets Hawksley Workman, Steve Bays of Hot Hot Heat and Ryan Dahle of Limblifter. In November the band sent out an official teaser video for their 2014 spring tour that previewed the infectious retro-rock riffs that epitomize their full-length debut Thrash Rock Legacy. 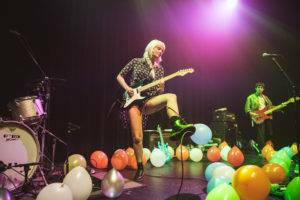 The trio’s Friday night Commodore Ballroom show marked its Vancouver debut in a rump-shaking show complete with streamers and confetti. The Mounties came on shortly after Aucoin’s confidence booster – the three men approached the stage with an extra hop in their step. Bays’ unmistakable curly ‘do even seemed to have some extra bounce to it as he sang along to the glittery dance tune “Pretty Respectable”. The group may still be getting used to their all-star lineup – they started off slightly frenzied and their vocal harmonies weren’t quite lining up. But they pulled it all together in time for “Feeling Low”, bringing in all sorts of Kraut rock and power pop elements to the fore. The eclecticism of the track reflects Mounties’ adventurous outlook – they’ve definitely crossed over into more experimental waters with their tongue-in-cheek project, bringing to memory mind-bending bands like Animal Collective and tUnE-yArDs. They played nearly every track off Thrash Rock Legacy with incredible fervor, giving the audience a mixed bag of high-energy sounds their recently released debut full-length offers. “Hall and Oates” recalled ’70s glam and showcased Dahle’s exceptional guitar solos while Bays smashed out some psychedelic riffs on his keyboard. Workman laid down a poetic interlude on the sun-kissed, grungy “Made Up My Mind” that unexpectedly simmered down into a bossa nova groove. One of their final tracks was their head-bopping lead single “Headphones”, sure to be one of this year’s summer anthems. With the band being led by three unique and vivacious talents, it’s difficult to know where they’ll be taking their new labour of love; but I’m certain these fast friends will make it one fun ride. 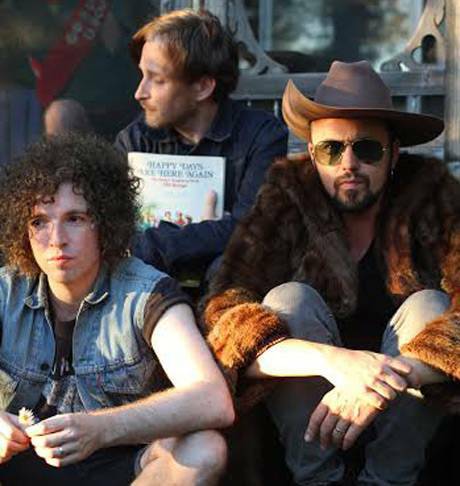 This entry was posted in concert reviews, Features and tagged Hawksley Workman, Mounties, Ryan Dahle, Steve Bays. Bookmark the permalink.